Its Hugo’s second win in as many years and sixth major XTERRA title this season. His winning time of 2:17:57 was less than a minute ahead of 7x World Champion and 7x Richmond winner Conrad “the Caveman” Stoltz. Hugo passed Stoltz in the last mile of the run to win the race. Stoltz simply crushed the bike course today, as he’s done so many times before on these trails. He posted the fastest bike split by more than a minute, putting on a show for all to see both here in Richmond and around the world thanks to the live feed provided by Luck Stone. Stoltz father Gert passed away in 2012 and Scott “Scud” Scudamore – a long-time XTERRA Ambassador and dear friend to many in this sport and beyond, passed in December. The XTERRA race numbers had “Scud” in the background in his honor, and his wife Margaret fired the cannon to get all the action underway. Clearly, those two men will never be forgotten. The race’s other notable favorite – Josiah Middaugh – who hadn’t lost a regional championship race since 2012, came out of the water 1:30 behind the leaders and couldn’t get close enough coming off the bike to make up the difference with his superior run. Middaugh ran into third place, breaking a string of five straight regional championship wins, but will return to racing in his backyard at Beaver Creek Resort in Colorado for the Mountain Championship next month with the chance to keep a perfect score in the Pro Series alive. Brad Weiss was solid all-around in fourth (remarkably, his 9th top four finish in majors around the world this season), Craig Evans was first out of the water and finished fifth, 18yo sensation Mauricio Mendez placed sixth, and Branden Rakita was seventh. For Hugo, taking the top spot in RVA is something special. Flora Duffy, a two-time Olympian from Bermuda, was ahead from the start, posting the fastest swim and bike splits and coming across the finish line in 2:35:36, more than eight minutes ahead of Emma Garrard from Park City, Utah. Safe to say all of Bermuda is celebrating Duffy’s success. She’s won every XTERRA she has entered this season – the West, Southeast and East titles plus South Africa and the Asia-Pacific Championship race in Australia where she went up against reigning XTERRA World Champion Nicky Samuels. There is simply no one better right now, and today she found a course that melted her experience in racing in cities with her new-found passion for the trails. Duffy pulled away early in this one, posting a 16:11 swim split that was more than two minutes faster than everyone but Christine Jeffrey and almost four minutes quicker than Garrard, the eventual runner-up. Shonny Vanlandingham finished in fourth and Christine Jeffrey rounded out the podium. Today was a really big day for several hundred amateur triathletes from across the U.S. as each division winner was declared the USA Triathlon Off-Road National Champion, the XTERRA East Champion, and earned qualifying spots into both XTERRA Worlds this year and the ITU Cross Tri World Championships next year. Rob Ricard picked a good day to have his best XTERRA race ever, edging Dan Molner by just 17-seconds to capture the amateur crown and win the one-of-a-kind, hand-crafted granite Luck Stone trophies. In the women’s race it was all Hannah Rae Finchamp (pictured), who came back to “redeem” herself on this course after struggling through it last year. She finished sixth woman overall and now has a USAT Nationals crown to go with her XTERRA USA and World titles. Finchamp will certainly be one of America’s best chances to medal at this year (and next year’s) ITU Cross Tri World Championships. She’s headed to XTERRA Germany, which is doubling as ITU Worlds, this August. Also of note in the amateur races is Dr. Kathleen Coutinho who won her division here in Richmond for the 10th time; and Brian Hughes, who finished on the podium in the 35-39 division 16 years after winning the 20-24 division in the first XTERRA Richmond. Thanks to Luck Stone who made XTERRA in Richmond one of the coolest events on the planet. They provided hundreds of volunteers, dozens of racers, amazing live coverage, the best race trophies ever, and the nicest people around. 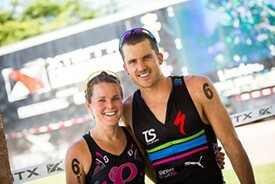 They “Crushed It” for XTERRA and all the while, ignited the human potential in all of us. XTERRA East Champs was the 17th of 36 events where the fastest amateur athletes from around the globe could qualify to race at the 19th annual XTERRA World Championship at Kapalua, Maui on October 26, 2014. Up next, XTERRA Greece at Lake Plastira next weekend.